A High Quality 3.5mm Jack Plug to 2x Phono cable. Manufactured from Oxygen Free Copper cable. Colour coded high quality moulded phono plugs and 3.5mm jack plug with gold plated contacts. Ideal for hi-fi and audio applications, great for connecting an Ipod to a hifi. 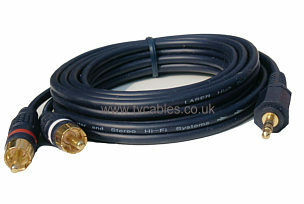 Manufactured from oxygen free copper cable (OFC) and sporting colour coded moulded phono connectors with gold plated contacts this cable really is a bargain. 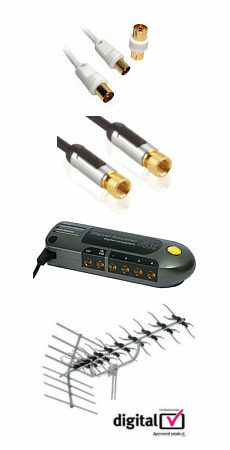 This lead is perfect for connecting stereo audio from Personal Computers (PC) to an amplifier or Hi-Fi system or for connecting audio from CD players, MP3 players etc. Profigold by Bandridge PGV6605 5m s-video to s-video interconnect. Enjoy superior home cinema with crisp video and vibrant colour. Features 4 pin mini din s-video connectors. Diecast connector bodies. 24k Gold Plated contacts ensures optimum signal transfer. 99.96% OFC conductor for high resolution picture quality. Cellular PE insulation ensures clean video. IAT interference absorbers for unmatched picture performance. Lifetime limited warranty against defects or workmanship.